Rose and walked Mix before breakfast. David arrived and we set about installing the final four power points within the Bothy – there are now eleven, a sign of how much we rely on electricity today. Today was the final day of the current kilt-making course before Christmas. 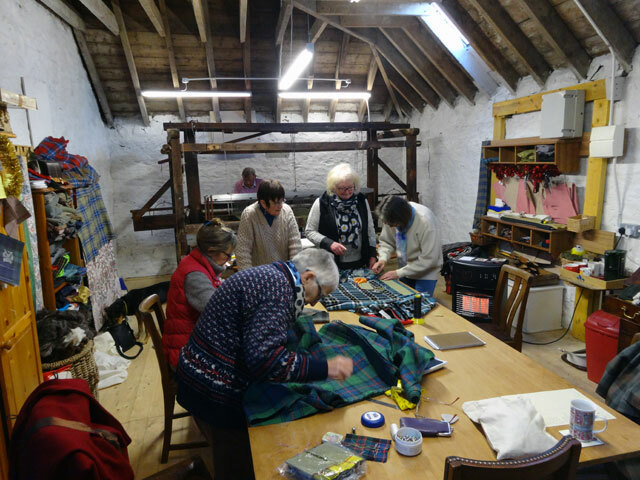 The gas heaters ensured that everyone was warm and, in addition to the kilt-makers, Sandy arrived to complete the warping of the loom and Tom came along to assist in rebuilding one of the heavy rollers which is integral to the working of the loom. Later in the morning Ann arrived with her husband Jack who stayed on with Mum during the day as Ann went off to do her Christmas shopping. David entertained Jack with stories of his musical days and later, after we had all enjoyed a buffet lunch, with an impromptu performance on my guitar accompanied by his new effects pedal. Soon afterwards David set off to prepare for a dinner he was attending tonight. I went off into Duns with Rachel to buy a Christmas tree and also to get the final bits for the Christingles – and I remembered the licorice allsorts! Olive has now started marking accountancy examinations, something which will keep her busy into the New Year. After dinner Rachel and I made up the Christingles while watching an episode of New Tricks on the television. It was good to walk the dogs and get to bed – it really is very cold.